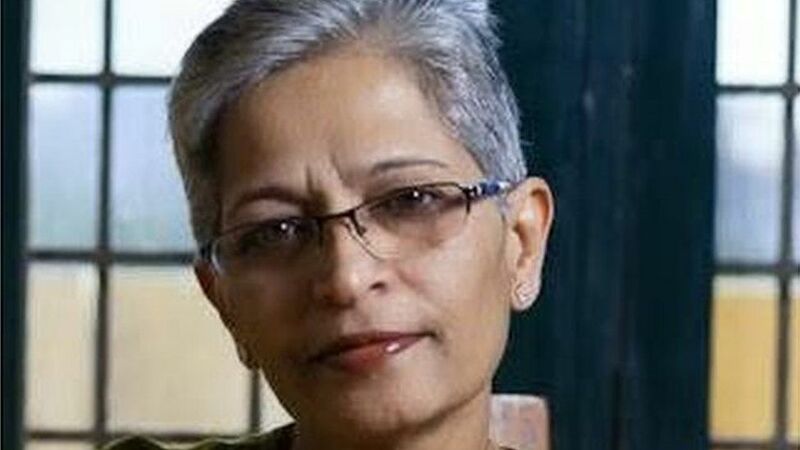 A man has been arrested in connection with the murder of prominent Indian journalist Gauri Lankesh. KT Naveen Kumar was earlier arrested in an arms trafficking case, but he had revealed his role in the murder during interrogation, police say. Ms Lankesh was shot dead outside her home in the southern city of Bangalore in September last year. She was the most high-profile journalist murdered in years. Her death sparked off protests across India. Police say however, that Mr Kumar is not the main accused in the case. As a journalist, Ms Lankesh often made statements that were constructed as dissent against the establishment. A week after her death, there were protests against her killing in several Indian cities, including the capital, Delhi. She was known for her left-leaning views. As a journalist, she edited a weekly newspaper and cast a critical eye on Hindu fundamentalism in politics and fiercely opposed the caste system. The Committee to Protect Journalists, a non-governmental organisation, has ranked India as a country with a poor record in safeguarding journalists. Their research shows that at least 27 journalists have been murdered because of their work in India since 1992.